You're a great dog owner, right?That means you should be able to answer my next question:Do you know what goes into your dog's food before they eat it? Sure, you probably know if your dog likes the food or not based on how much they eat, but do you know how much their body likes the food?Food has come a long way since the early years when dogs ate scraps, through when they ate low-quality filler kibble.One company that was instrumental to the development of many of the varieties of dry dog food that we now use to temp our pup’s pallet can trace back to innovations and entrepreneurial vision of two German immigrant families. 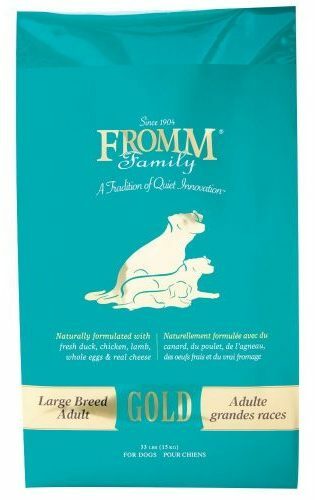 Who Makes Fromm Dog Food and Where is it Made? What Dogs Should Eat Fromm? What Dogs Might Be Better on A Different Brand? Fromm dog food has a long history of developing nutritional diets for the canine family, beginning with the company founders immigrating to the US from Germany and starting the business in 1904.It’s rare to find a company that has been in operation that long, and the original family heirs still own the business!The Fromm and Nieman families started their journey as fox fur farmers and experimented with different diets on their livestock. Through trial and error, they learned how to develop diets to get larger litters and healthier coats. Fromm laboratories were also instrumental in developing the canine and feline distemper vaccine in the 1930s, after creating it to protect their foxes. In addition to advancing the medical forefront, Fromm also pioneered the first methodology for cooking meat and grain together into a granular pet food in the 1940s; making it a lot more convenient to pour a your dog a fast bowl of kibble. Science and research have been a strong, standing tradition with this company. 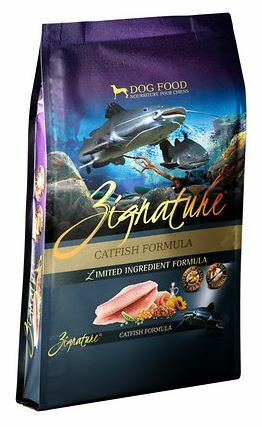 ​Fromm also uses human-grade, high-quality ingredients, which make them very popular with premium pet food customers. While they are much pricier than your average grocery-store brand, they produce smaller batches of food for quality control reasons, which accounts for some of the higher costs. This dog food company has been evolving through five generations of both the Fromm and Nieman family, who immigrated to the US originally in 1852. They set up their family farm in Wisconsin and began raising foxes. A by-product of creating furs was perfecting the fox’s diet to produce larger litters with healthier coats. Eventually, the family got out of the fur business and leaned on their long history and dietary research to begin producing dog food. Fromm has remained in Wisconsin and now has two manufacturing factories in the state. 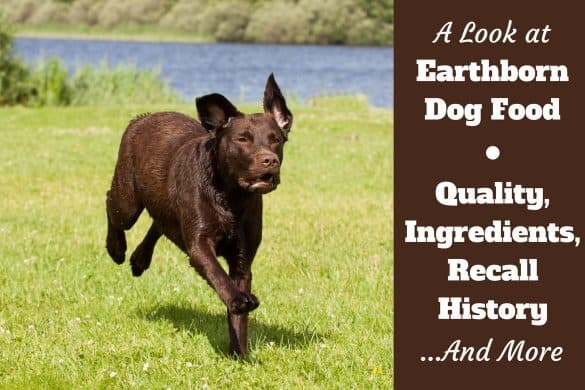 The company’s product line has a large variety of both dry and wet dog and cat foods for all life stages, and demand for their products has continued to remain strong for decades. Duck, Duck Meal, Pearled Barley, Sweet Potatoes, Brown Rice, Oatmeal, White Rice, Dried Whole Egg, Millet, Dried Tomato Pomace, Safflower Oil, Cheese, Flaxseed, Carrots, Broccoli, Cauliflower, Apples, Green Beans, Chicken Cartilage, Potassium Chloride, Cranberries, Blueberries, Salt, Monocalcium Phosphate, Calcium Sulfate, Chicory Root Extract, Alfalfa Sprouts, Yucca Schidigera Extract, Sodium Selenite, Folic Acid, Taurine, Parsley, Sorbic Acid Preservative), Vitamins, Minerals, Probiotics. A dog food is only as good as the ingredients contained within the bag. When you read the ingredient panel of any dog food, it’s important to note that the ingredients are listed by the largest percentage first, just like for human food labels.For simplicity, we will examine the largest percentage ingredients, as these make the biggest impact on the nutrition of the diet. When examining any dog food, you want to look for meat as the first ingredient. However, raw duck has a large percentage of water. After cooking this ingredient into a dry kibble, removing the water will account for a smaller percentage of overall ingredient volume, which may push it down the ingredient list. It is important to note that this is a single-protein dog food. This is helpful if you have a dog that has food allergies, as there is only one protein source. This means the dog has less of a chance that they will have an allergic reaction to the food. Duck is also a novel protein, meaning it’s probably new to your dog. If they haven’t eaten it before, they may not have developed an allergy to it, and therefore won’t have an inflammatory response. Most mainstream pet food and treat companies use chicken or beef as their protein source. Coincidentally, these proteins are also now the most common pet allergies in dogs. When people read “meal” after a protein, they sometimes feel it is a lower-quality protein than the original meat source. However, high-quality meat concentrate actually offers your pup more protein than whole meat ingredients. Duck meal is made from a process called rendering. Duck meat is cooked down into a stew, then intentionally overcooked until most of the water content has been evaporated. It is then baked and turned into a protein powder. The result is a very high-quality protein source. Duck meal actually contains 300% more protein than fresh duck. Barley is also an excellent fiber to feed your dog, as it contains both soluble and insoluble fiber. The soluble fiber helps slow absorption to keep blood sugar more stable, while feeding the good bacteria in the intestine. The insoluble fiber helps keep your Lab regular while giving more bulk to the food and keeping them full longer. 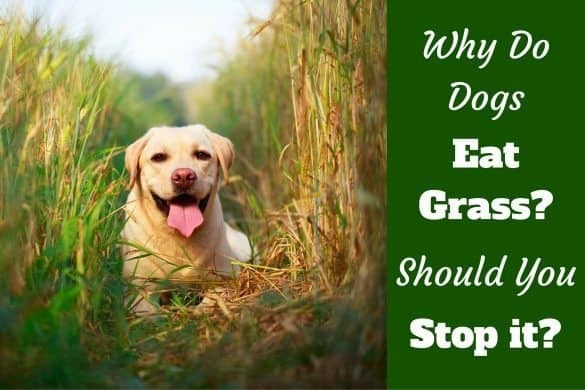 While barley is a more controversial ingredient to some people, as they feel it is just a filler, there is also convincing evidence that it is important to your pup’s beneficial bacteria. This ingredient is a great source of beta-carotene and a gluten-free source of a complex carbohydrate. Like barley, it is also a great dietary fiber that can improve colon health. Cooked brown rice is a complex carb that is easily digested, providing that extra energy pep in your pup’s step. ​However, there have been concerns about arsenic content in brown and white rice. This is not just an issue for pet food, it applies to the human supply as well. ​You should know that organic arsenic is found naturally in the environment. Inorganic arsenic was also used as a pesticide in the 1980s, and residue is still found in the soil. Rice just seems to have a certain talent for absorbing more arsenic than other plants. While FDA studies insist no adverse effects for dogs from rice, it’s still important to be cautious about this ingredient. The FDA is proposing a limit for inorganic arsenic levels in infant rice cereal. If this occurs, the natural result is that rice rejected due to higher arsenic content for infant formula may make its way to pet food. This ingredient is another whole-grain carb source made from finely ground oats. It is rich in B vitamins and healthy dietary fiber. White rice is less nutritious than brown rice, as the grain’s healthier outer layer has been removed. However, if your concerned about the arsenic content, white rice actually tests lower than brown rice in this regard. This ingredient is a dehydrated powder made from shell-free eggs. This protein source has a very high biologic value, meaning it is highly digestible and able to be utilized completely by your dog. The egg is the perfect protein, and the standard by which all other sources are measured. Millet is a gluten-free, hypoallergenic grain harvested from grasses and rich in B vitamins, fiber and other essential nutrients. This ingredient is more controversial, as it’s the by-product of making tomato juice, ketchup and soup.Advocates for this ingredient claim it’s a highly beneficial, antioxidant-rich soluble fiber that helps with a dog’s intestinal health by feeding the beneficial gut bacteria while producing less gas than alternative sources. The critics simply think it’s unnecessary filler. Once we’re past the tenth item on the dog food ingredient list, the ingredient percentage becomes so small it won’t provide much impact on overall food rating. However, even a small amount of certain ingredients can pack a pretty strong punch. Flaxseed is a great plant protein source. Carrots, Broccoli, Cauliflower, Apples, Green Beans, Cranberries, and Blueberries are all rich in antioxidants, vitamins and minerals. Chicken Cartilage is also provides glucosamine and chondroitin sulfate, which are two important ingredients that support joint health. Chicory Root Extract contains inulin, another prebiotic that helps to grow healthy bacteria in the gut. Taurine is also an amino acid crucial to dog’s health. Is Victor Dog Food Any good? 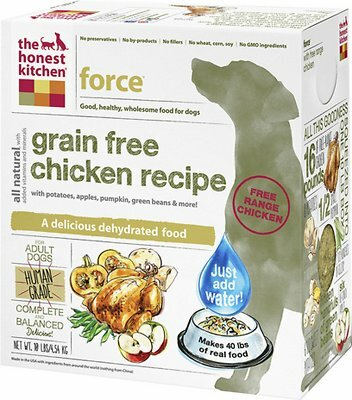 Would we recommend Honest Kitchen Dog Food? The reason behind the recall was due to elevated levels of Vitamin D.
To their credit, the company caught this issue from their own quality control analysis of the food; and immediately took steps to get the product off the shelves. Thankfully, no pets were reported sick from the excessive Vitamin D levels. While Fromm does have life stage and large breed formulations in their other lines, the four star Duck and Sweet Potato is formulated for all life stages. Should you require puppy food, large breed varieties or senior-specific formulations, Fromm also gives targeted choices to meet more specialized needs. 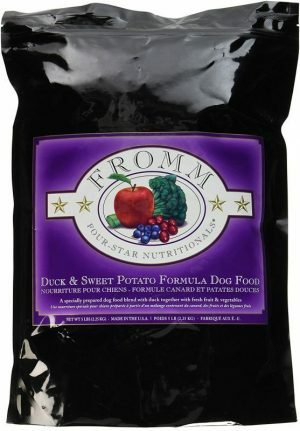 Fromm offers many exciting dry dog food combinations in addition to the Duck and Sweet Potato formula we’ve reviewed in this article. Fromm dry dog food comes in five, fifteen, and thirty-pound bags. Fromm dog food is well suited to a wide variety of dogs, and formulated to target some specific needs. Fromm offers a few choices in puppy formulations, Puppy Gold and Heartland Puppy Gold, which are also suitable for pregnant and nursing mothers. They have an additional diet for larger-breed puppies, Large Breed Puppy and Heartland Gold Large Breed Puppy. 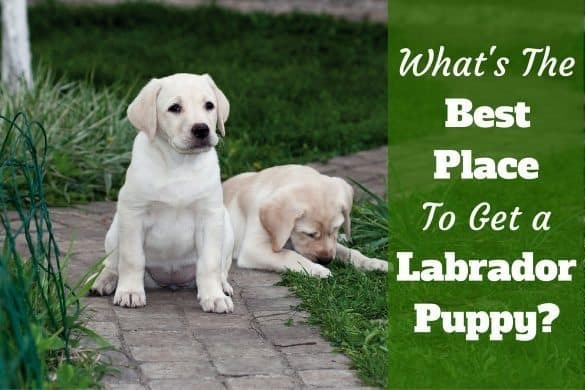 Studies have shown that large-breed puppies have slightly different nutritional needs than smaller breeds, so it’s good to find companies that recognize this research. 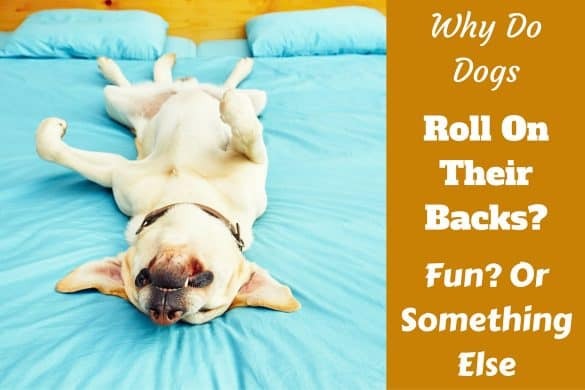 Fromm has several different formulations that cover the needs of active, healthy dogs and supply them with plenty of energy to catch a Frisbee or be your jogging buddy. While Fromm doesn’t specifically call out an allergy diet, their use of novel proteins like duck, rabbit and salmon in some of their foods may help dogs suffering from beef or chicken food intolerances. They also offer grain-free foods, which help eliminate some additional ingredients that could aggravate your pup’s inflammatory response. While dogs can become allergic to a wide variety of ingredients, eliminating the most common culprits goes a long way to controlling the symptoms. 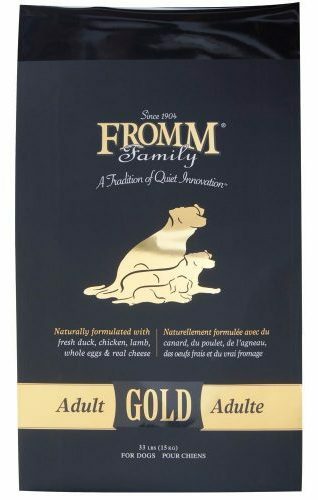 Fromm offers a senior formula Mature Adult, for older dogs that may need less calories or have lower energy needs. It also helps with weight management. Fromm has created a lower-calorie option, Weight Management Gold and Gold Coast Weight Management, for dogs that can’t seem to keep the pounds off. Fromm claims it helps reduce weight without sacrificing taste. It's rare to find a food that fits every dog's needs. Here are a few examples of dogs that may do better on a different diet. If you want a company to focus on breed-specific nutrition, such as a diet tailored to Labrador retrievers, Fromm may not be the company that best fits your dog.Some pet food companies will focus on addressing specific challenges, like health issues more common to the breed, through diet. 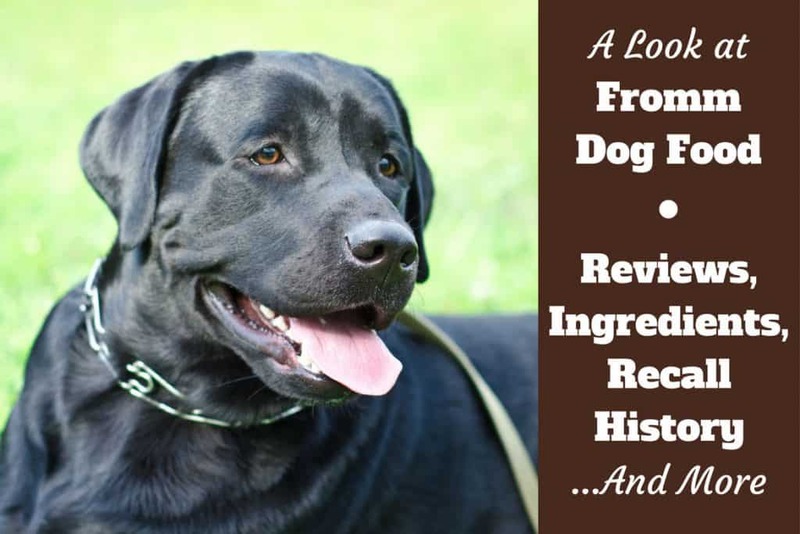 ​Labradors suffer from hip dysplasia, so you may want a food that targets joint health by adding higher levels of glucosamine and chondroitin sulfate.However, Fromm does offer the Adult Gold Large Breed Formula to address the needs of larger dogs, so you may feel this is adequate for your Labrador. While Fromm offers both a small and large breed formula for adult dogs, and a large-breed puppy formula and senior formula, they don’t go beyond this selection when it comes to life stages. ​If you have a senior dog that needs a small-breed formula specific to both geriatric age and smaller size, you won’t find it. If you’re looking for a large-breed specific diet that also tackles weight management, you’re out of luck. You will have to choose food either specifically tailored to your dog’s size, or to their life stage or weight challenges. Here are some thoughts on three of the more popular Fromm formulations. This dog food uses novel proteins found in duck and antioxidant-rich sweet potatoes to create a great diet for healthy, active adult dogs. It contains healthy soluble and insoluble fiber and prebiotics for gut health.The first two ingredients are novel meat proteins, which are reflective of a premium diet. The sweet potato as the main carb source means this food is lower in grain content than less premium foods. The benefit of this is there is less chance of dogs being allergic to this food. The wide variety of fruits and vegetables also offers your dog a larger array of natural nutrient sources to utilize. Fromm’s Adult Gold line is a great general dog food for healthy, active dogs. 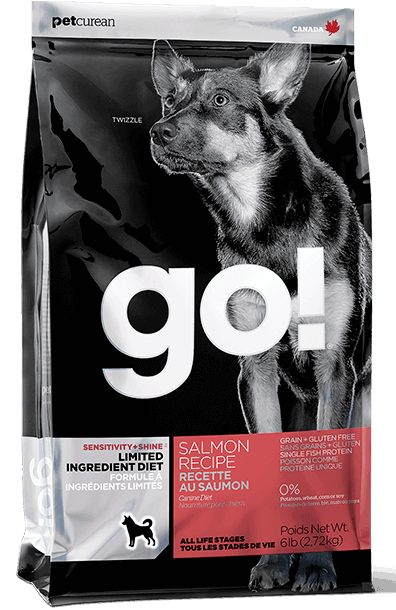 Its first three ingredients are meat sources, which helps ensure your pup gets adequate protein. This food also offers a wide variety of meats, from duck, chicken, lamb, as well as Wisconsin cheese and eggs to top off the protein sources. If you have a dog with food intolerances or allergies, this wider protein offering may not be a good choice for your pup. However, if they are healthy, the ingredient list should offer them both great taste and nutritional variety. Enhanced probiotics to aid in digestion and salmon oil to give adequate Omega-3 and DHA for coat and brain health top out the list of why this is a great food choice. Fromm does offer a large-breed formula that addresses the needs of dogs over 50 pounds. 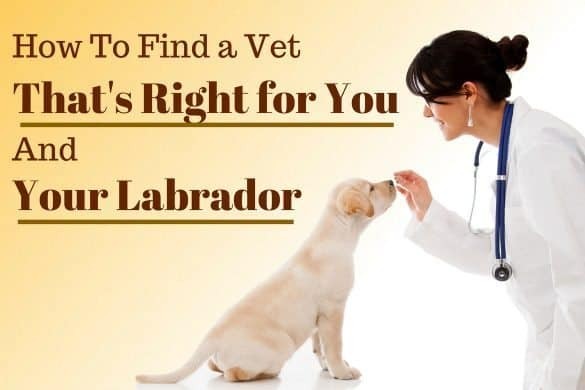 Specifically, it includes cartilage that targets joint health with glucosamine and chondroitin sulfate, and includes probiotics and prebiotics for digestion and salmon oil to help create a healthy coat. The first three ingredients are also meat, and include duck, chicken meal and chicken. Again, if you have an allergy dog, the chicken could pose an issue as many dogs are allergic to this protein. ​The expense. A Labrador eats so much more food than a toy breed, and a 33-pound bag of Adult Gold currently runs about $130 on Amazon. However, if you can afford the premium prices, it’s certainly a very healthy choice for your dog. Here are some reviews from other respected sources, and how they feel about this company. Dogfoodadvisor.com highly recommends Fromm. However, they do feel that the protein content could be higher for the premium price tag, and that the formula is more plant based. They feel that the 27% protein content and the mean fat level of 17%, giving an estimated carb level of 49%, show near average protein, fat and carbs when compared with a typical dry dog food. They give the product a 4 out of 5 stars. Dogfood.guru likes Fromm overall for having quality meats as the first and often second ingredient. However, they aren’t as happy with their use of pearled barley and tomato pomace, as many of their customers see it as an inexpensive filler. They also give the company a respectable 4 out of 5 stars. Amazon.com has compiled reviews of Fromm customers, and overall the comments have been very positive. There are a few customers who said their pup turned up their nose to the food, but the general consensus has been overwhelmingly positive. If you can't get a hold of Fromm, here are some other premium brands we recommend. Overall, Fromm uses high-quality, human-grade ingredients in their formulations. They operate in the US and have high quality control standards. We also appreciate their long company history, their focus on research and science in their formulations, and their contributions to dry dog food technology and vaccine advancement. Our main drawback of this diet is their more limited product line to address specific breed needs and multifaceted dietary issues. For example, we would like to see a small or large breed senior line, as a dog’s nutritional needs stay the same for their size, but can change with age. Breed-specific diets tailored to utilizing nutrition to prevent specific breed health concerns would also be promising. 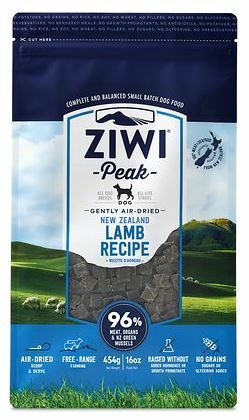 Finally, for the price tag, we’d like to see this dog food offer a higher meat and fat content, with slightly less focus on plant-based carbs. Overall, we will agree with the general consensus and give Fromm pet foods a 4 out of 5 stars. 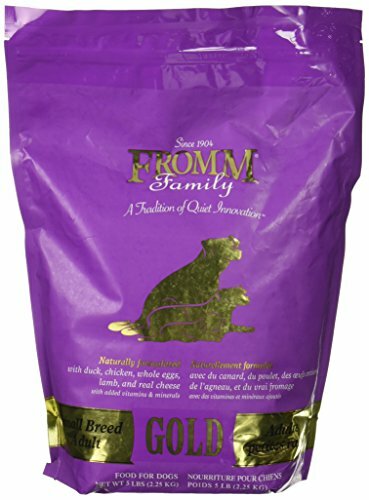 ​If you’re looking for a solid company that offers high-quality foods, we highly recommend Fromm.You will probably agree with the many happy, loyal customers that have already seen amazing results as their dogs truly appreciate the great-tasting, healthy comfort food that this company offers.